Those who already have a sound knowledge of the English language, and need to improve their written communication skills to impact results and/or those who have successfully completed the English Grammar & Composition Level 202 course. 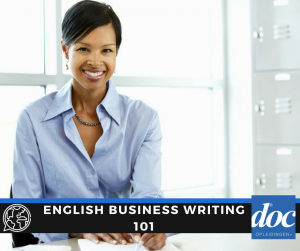 This course is a practice-based program to apply contemporary skills in the presentation of communication principles, as to ensure a correct and impressive format in writing, reports, minutes, proposals and more. We help you reach your goals by teaching you how to organize your thoughts, how to make your writing more effective, how to write the way that business people read, how to capture the reader’s attention up front, how to make a positive impression, how to tailor your message to your audience, how to use your writing resources and how to avoid sounding starchy or overly formal. Our special teaching techniques enable us to continue building on participant’s existing know-how, learning style, and interest. We focus on the outcome of the course, as well as the learning process. We keep this process dynamic, flexible, interactive, goal-oriented, pleasurable and challenging. The course consists of 10 weekly sessions of two hours of instruction by an authorized instructor, course material, multiple exercises, individual guidance, a mid-term test and upon satisfactory completion, you will receive a certificate.